These photos are old, and the people in them may no longer be with us. However, it's good to have these remnants of past times. 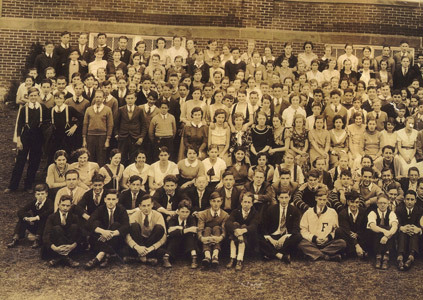 If by any chance you recognize any of these students or others in the photos from your own family photos or other sources, would you please let me know? I'll be happy to post that information to share with others. This photo was sent to me by Ann Nakpairat. 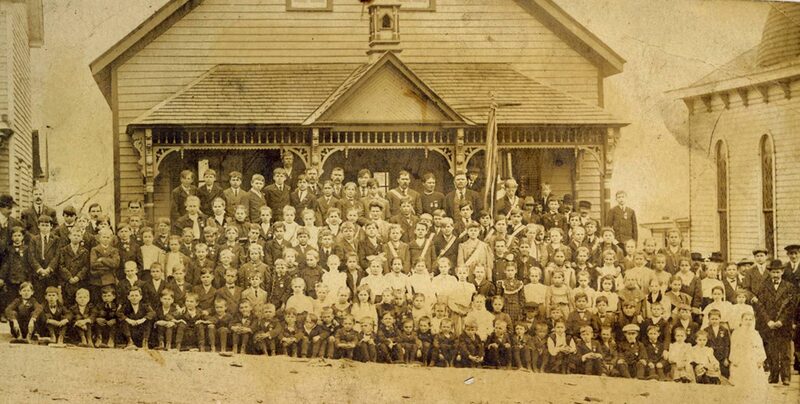 It's an early photograph of the St. Mary's Greek Catholic Church students, which she dates at around 1896. 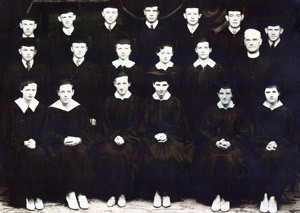 According to Ann, her father, John Malenky, is in the first row, fourth from the right. 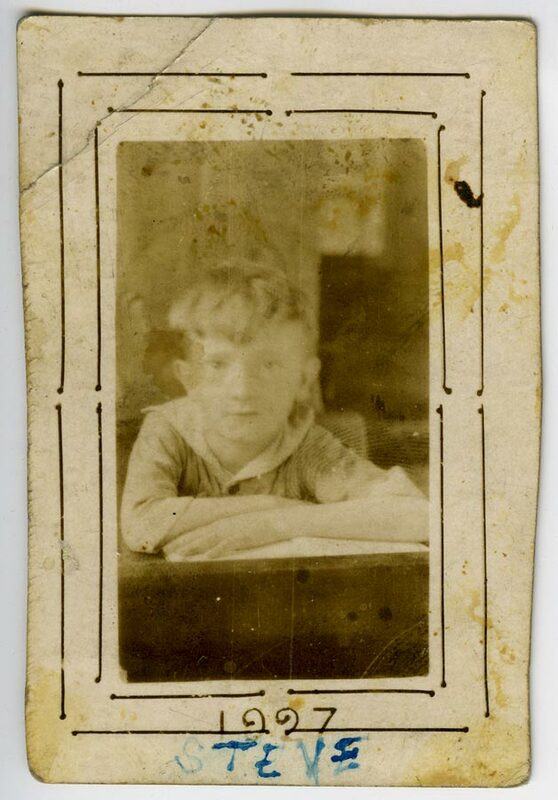 Born in 1890, he is wearing a cap and appears to be about 6 years old. 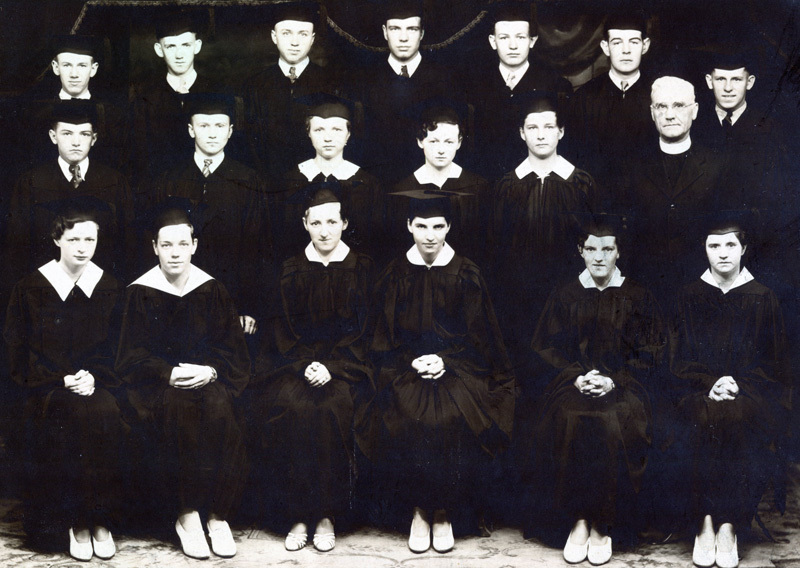 Her grandfather, George Malenky, said to be a founder of the church, may be the gentleman with the mustache standing in the top row at the far left of the photo. 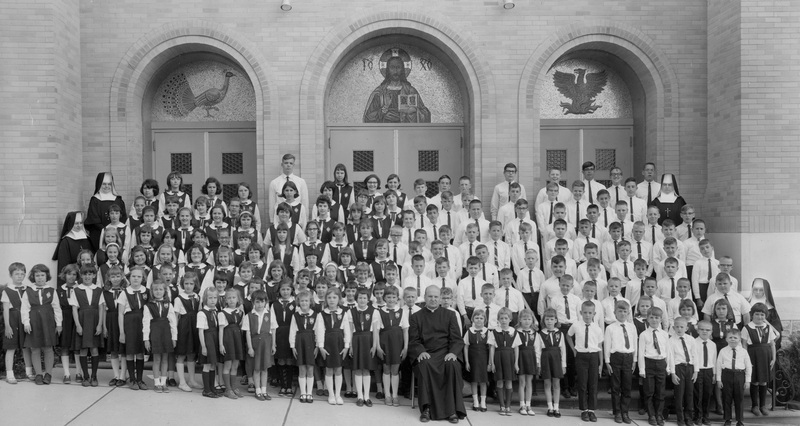 By contrast, here is a student group picture from the early 1960s taken in front of the church, which had been remodeled in the few years before the photo was taken. My brother Steve is in this one. See if you recognize yourself or anyone else! 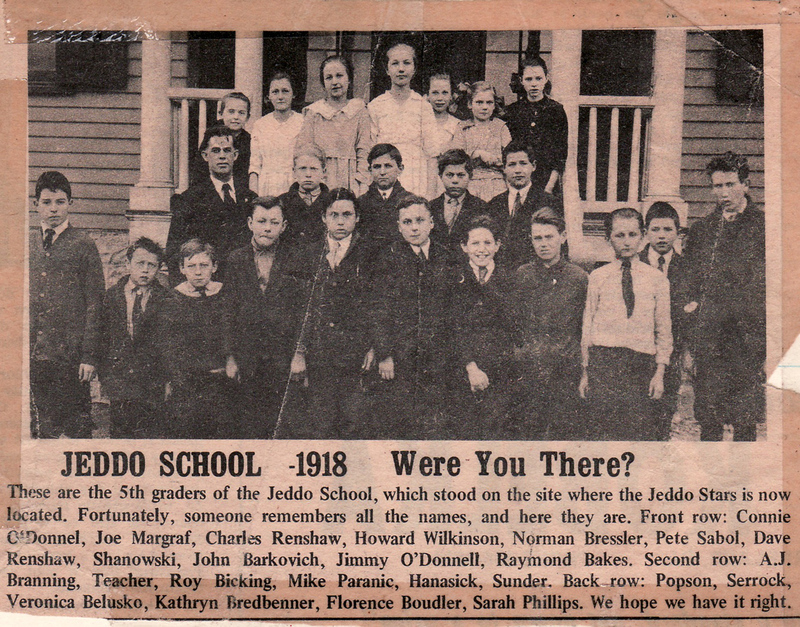 This newspaper photo of Jeddo School students from 1918 was kindly lent to Tom Landers for me to be able to scan a copy during a visit to Freeland in August 2008. I don't know who lent it for that purpose. I scanned all of the material that he had collected from Freeland area people who were willing to let me copy their items, and then I returned all to Tom, except for a few items that the persons involved had explicitly said I could keep. I'm grateful to all of those people who shared their historical items with me that way, and to Tom for being willing to gather the material and then return it to the owners. This photo comes to us from Judy Domchick, who wrote: "My Grandfather was George Domchick from Freeland who married Elizabeth Wilson (of Alvin Street). He was a butcher by trade. 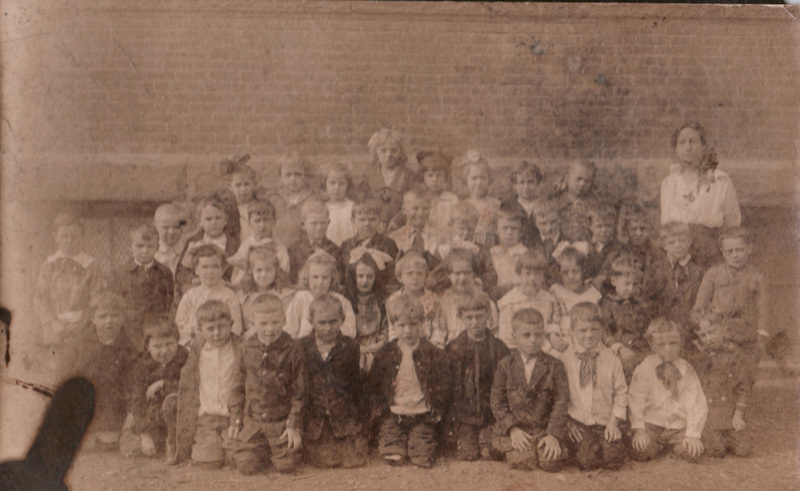 The picture I have is of him among children attending the South Heberton School. The back of the photo says "South Heberton School, Miss Bilgar, Techer. About 1900." I found Miss Bilgar's name on one of the documents that was printed on your site. It said Miss Sadie H., domestic, h 4 Birkbeck. 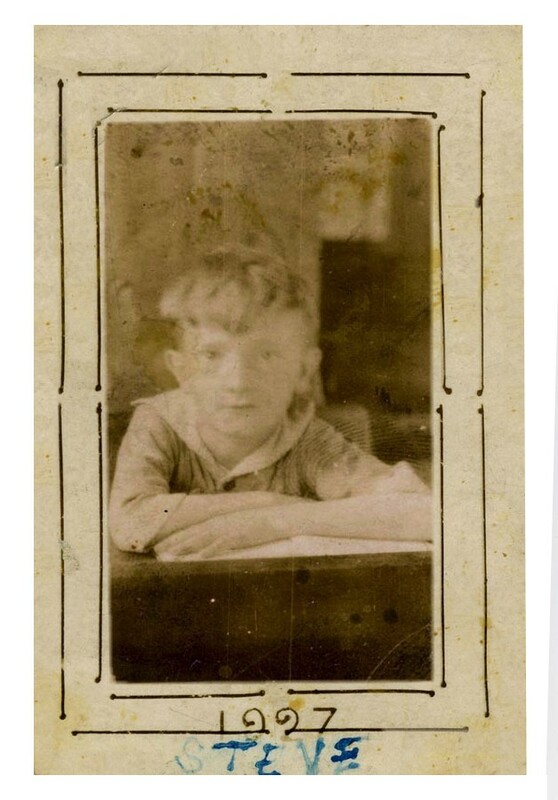 This fits as my Grandfather was born in 1889." 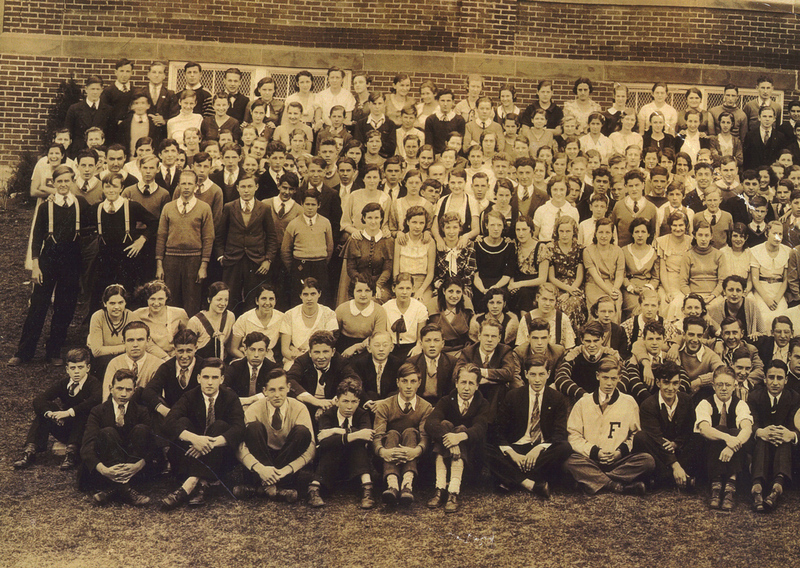 If anyone out there can identify anyone else in this photo, would you please let me know? 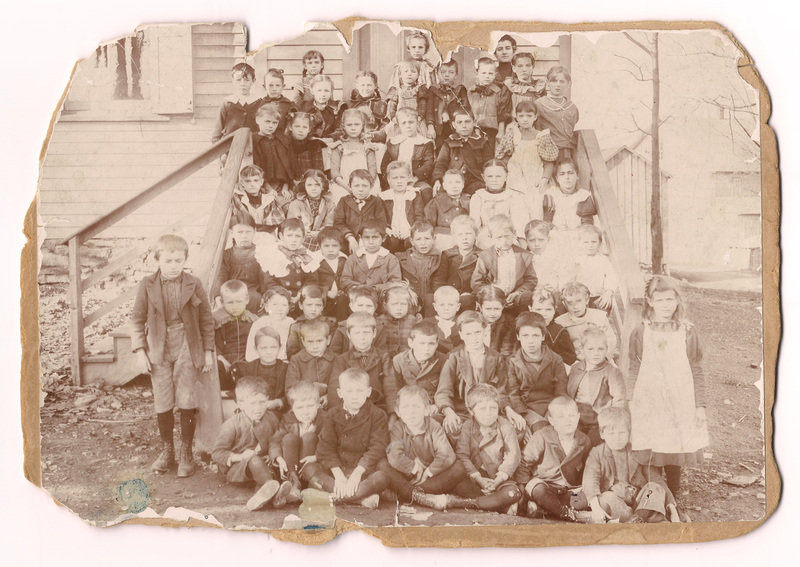 School children, public school on School St. just west of Vine St., early 1900s, from Nadine Heckler: "The photo of the children in the school ... 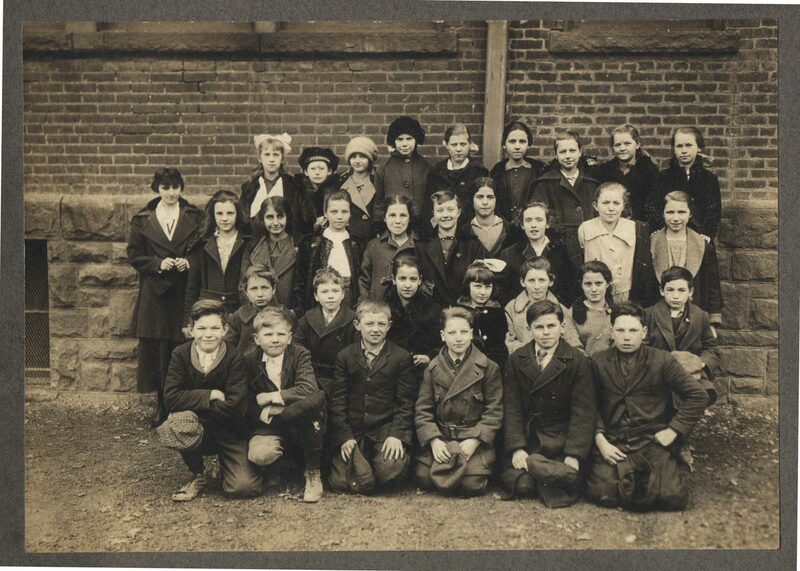 I'm told that Esther Williams is one of the children in that photo at a school in Freeland that was on Fern Street up near Walnut St. hill. The photo would have been taken I would say 1901-1905." After I posted this, Nadine checked with her aunt Esther who confirmed that this was indeed the public school on School Street, just west of Vine street. 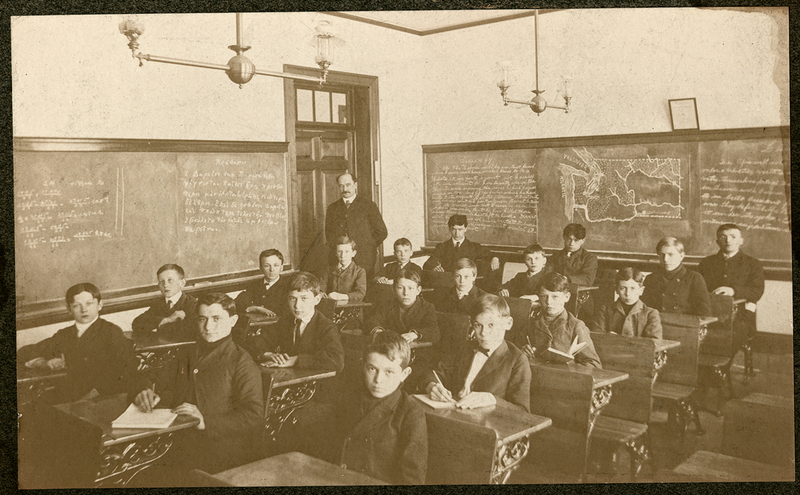 Photos from Mary Rosenkrans and Ed Bacon: This is an MMI classroom, and that’s Mary’s and Ed’s great-uncle Peter in the back row, center seat. 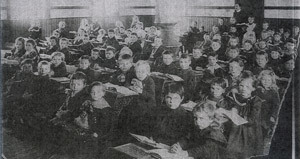 The note with the photo says it was taken in 1904, so that would have been at the newly built school below Carbon Street. 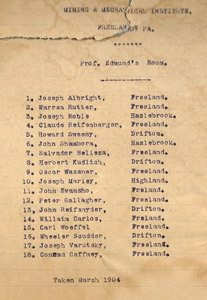 The teacher is Professor Edmund. It’s hard to read the blackboards, but the left boards contain a mathematics lesson and some Greek text. 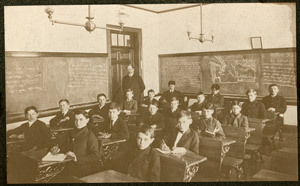 The boards to the right in this photo show text headed “Lesson 47,” a map, and more text. I’m adding a closer look at the faces. 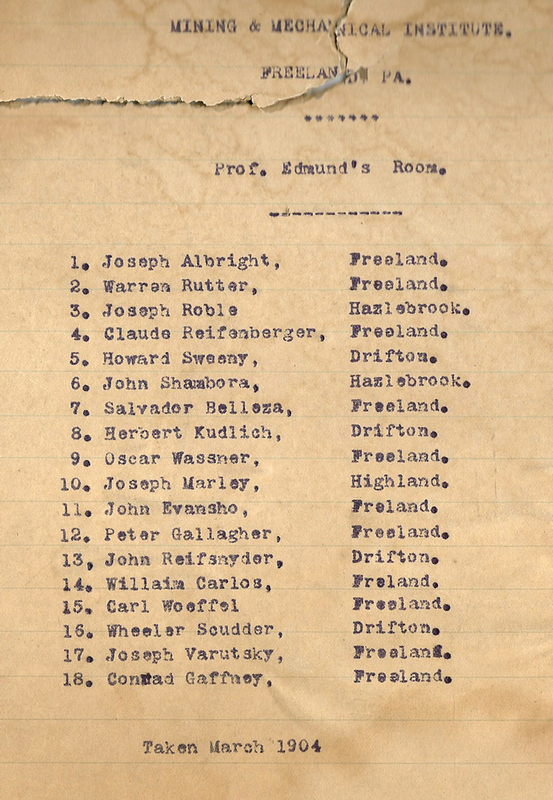 It looks like the students’ names on the list might be given in order, but if so we don’t know whether the list starts with the row nearest the blackboard or the row nearest the camera. Either way Peter is at the end of the middle group of six. "Here is a copy of a great old photo that my cousin in Sarasota, Ann Cravener, sent to me. It was sent to her by another cousin of mine, Nancy (Remak) Penn, who is the family's most ardent historian. The photo had been sent to Nancy by Carol (Corazza) Jones, with whom I went to school from grades 1 through 8, until we parted ways when I went to MMI." 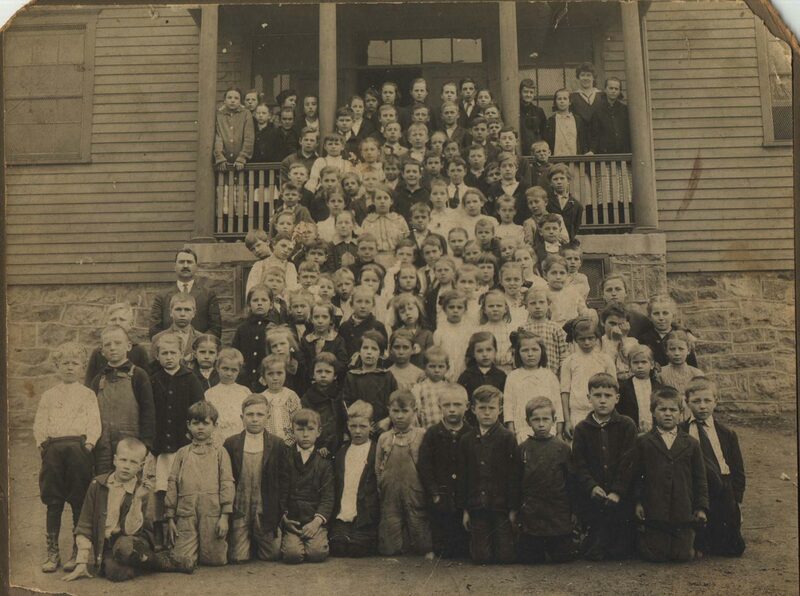 According to the legend at the bottom of the photo, these kids were in grades 1 and 2, with Miss Sara Gallagher as their teacher, standing in the back row at right. I love the ties on the two boys in the front row at right, and the big bow on the girl in the middle of the 2nd row. Several nice family links spelled out on the bottom of the photo, too. Thank you to Carol Jones, Nancy Remak Penn, Ann Cravener, and Ed Merrick for this! 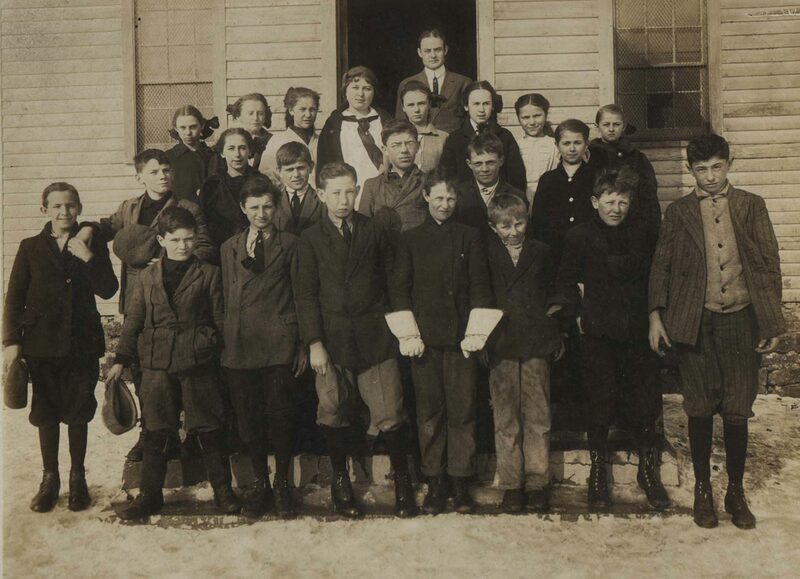 Daniel Coxe Memorial School students, 1919. Teacher, Miss Hinkle. Harold Davis, Violetta Deach, Mohan, Charles Derench, Stephen Yuhas, Ralph Barret, Vera Harris, Elizabeth Davis, Evelyn Zeisloft, Walter Nowak, Mabel Unagst, Howard Howe, Thel Davis, Prisilla Brehem, Mary DeComa, Anna Slank, Ida Squarko, Isadore Daubert, Angelene Durange, Nickolas Nocchi, Stella DeMarie, Emily DeJohn, Florence Saricks, Junior Griswals, Violet Kozel, Anna Tomcho, Jetta Burns, Amendler, Mabel Heller. Girl in second row, behind kneeling pupil, third from left is unidentified. Anyone know? Tell Nick Nocchi. That was the caption when this photo was reproduced in the PennySaver 6(7), Nov. 1968, p. 16. 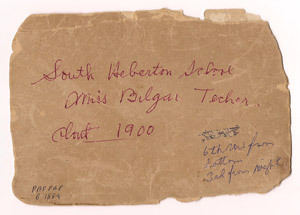 These names are written on the back of the photo itself: Violeta Deach, Elizabeth Davis, Mabel Unagst, Isadora Daubert, Mary DeComa, Evelyn Zeisloft, Priscilla Brelem, Anna Slank, Ida Squarko, Stella DeMarie, Mabel Heller, Ethel Davis, Vera Harris, ____ Amendler, Jetta Burns, Anna Timcko, Violet Kozel, Nicholas Nochie, Junior [Oswald? 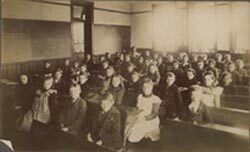 ], ____ _____, Florence Saricks, Emily DeJohn, Angeline Durange, Howard Howe, Walter Nowak, Stephen Yulius, Charles Derench, Ralph Barrett, ____ Mohan, Harold Davis, and teacher Miss Hinkle. The photo came from John Zubach, as do the last four on this page. 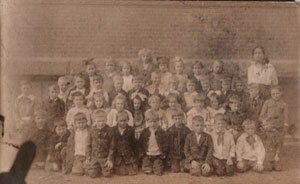 And another DCM photo from around 1919! 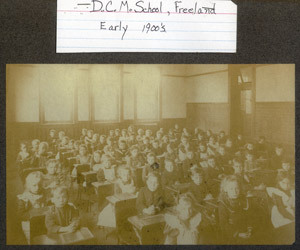 We have two copies of this photo; the sepia one at left was owned by Carol Jones, and both are provided here courtesy of the Freeland Historical Society. I have two more DCM classroom photos from Bob Zimmerman, labeled by him. The cropped copy might be easier to see faces in. There are a lot of little kids in this classroom! All looking well groomed and well behaved. Does anyone look familiar to you from your old family photos? If so, please let me know and I'll post information here. This is the other one from Bob Zimmerman, labeled by him. The cropped copy might be easier to see faces in. 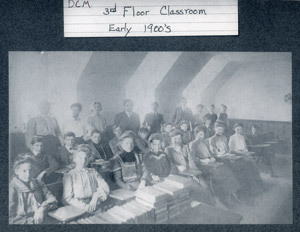 This one is quite different - Bob's label says D.C.M., 3rd floor classroom, early 1900s. These look like 7th or 8th graders, perhaps. Some teachers in this photo, too. 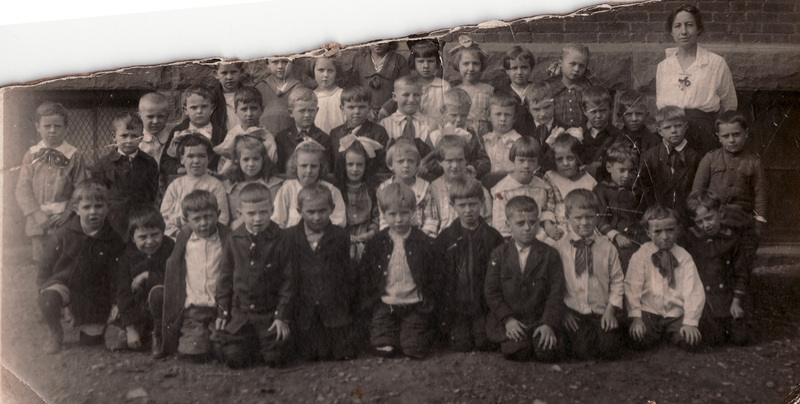 If you can identify anyone here from your own family photos or from old school documentation, would you please email me? I'd be happy to post the information. 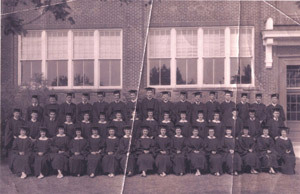 Foster Township High School graduating class, 1941. This photo was given to me at the end of a talk on Freeland area history that I gave at the Freeland branch of the Hazleton Area Public Library. Colleen Tatar was very kind in arranging that event, one of two that I spoke at there about 10 years ago. At those events I reconnected with old friends and I met some of the people who have been contributors and collaborators for my website and my research in local history, and I've been grateful for those connections ever since. I've added a crop of the photo at a higher resolution, hoping to make it easier to see individual faces. 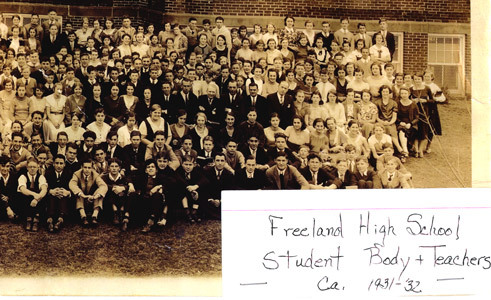 Freeland High School: These two photos (halves of a larger photo) come to us courtesy of Bob Zimmerman, who wrote the label on the right-hand photo. The photo was taken in front of Freeland High, showing the class of 1931-1932, along with their teachers. 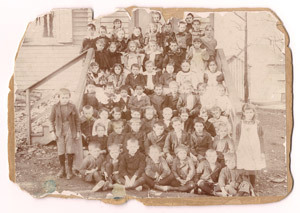 According to Bob, in the last row, 5th from left is Eleanor Welsh, and 6th from left is Eleanor Becker. 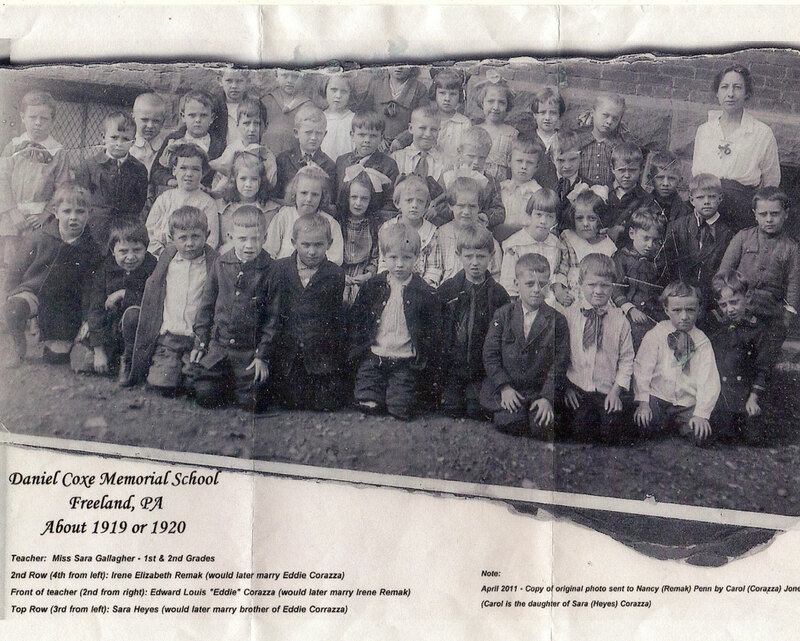 Third row, 6th from left is Mary Greshko who later taught at DCM and Freeland High. 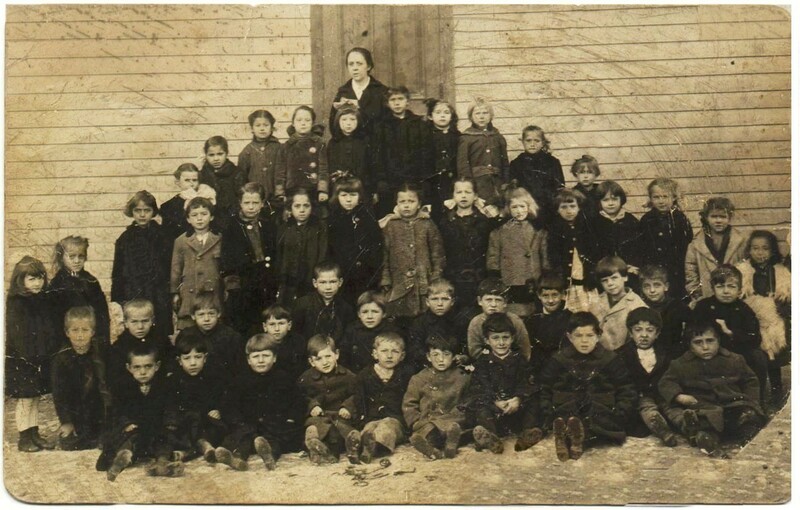 Larry Maso tells me that his brother Silvio is the boy at the left end of the very back row, with dark sweater and dark hair. If you recognize yourself or anyone else, will you please let me know and I'll add that information here? 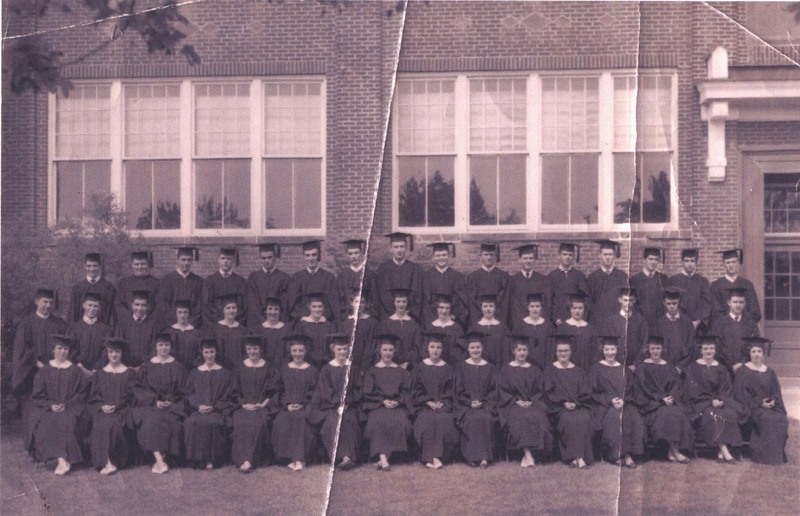 Freeland High School: This 1957 class photo comes from Bill Smith. 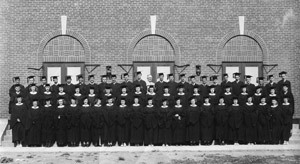 The photo was taken in front of Freeland High, and unlike the one above from 1932, this one shows the class wearing their graduation caps and gowns. I'm adding a crop at a higher resolution so faces can be seen a little better, although the photo I have is very grainy. If you recognize yourself or anyone else, will you please let me know and I'll add that information here? This one came from Eugene Della Croce. To my eye it may have been taken outside of St. Ann's Church on Centre Street (the church that was torn down in the mid-1960s and replaced by the current church, recently renamed Immaculate Conception), but perhaps it's older than that. ** Note: The enlarged view of this photo has been digitally repaired by Jay Cawley of Harleigh. He also digitally repaired my dad's grade school photo shown at top left of this page. Thank you, Jay. This photo was taken at the Sandy Valley School, according to Edward Kimmel. This last photo is from 1901.